In the past, culture was a kind of vital consciousness that constantly rejuvenated and revivified everyday reality. Now it is largely a mechanism of distraction and entertainment. 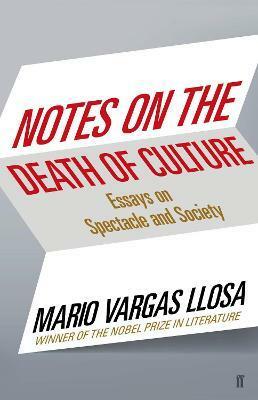 Notes on the Death of Culture is an examination and indictment of this transformation - penned by none other than the Nobel winner Mario Vargas Llosa, who is not only one of our finest novelists but one of the keenest social critics at work today. Taking his cues from T. S. Eliot - whose treatise Notes Towards the Definition of Culture is a touchstone precisely because the culture Eliot aimed to describe has since vanished - Vargas Llosa traces a decline whose ill effects have only just begun to be felt. He mourns, in particular, the figure of the intellectual: for most of the twentieth century, men and women of letters drove political, aesthetic, and moral conversations; today they have all but disappeared from public debate. But Vargas Llosa stubbornly refuses to fade into the background. He is not content to merely sign a petition; he will not bite his tongue. A necessary provocateur, here vividly translated by John King, provides an impassioned and essential critique of our time and culture.